I hope all you yanks out there are able to spend some quality time with your children on this beautiful MLK day off. My son and I went for a walk early this morning, and after telling him all about Dr. King and the civil rights movement, he got confused and asked, "Is it right or left or right or wrong? What kind of rights are we talking about exactly?" Whether you are home enjoying the break or praying for the people of Haiti, take a moment to remember that each and every one of us... we are all in this together. 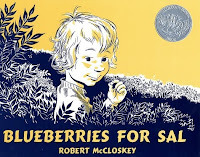 That said, this week I'll be giving away a newish, paperback copy of Blueberries for Sal by Robert McCloskey. All you have to do to be entered to win is comment on this post before midnight, January 24, Sunday. A winner will be announced the next morning. The winner of last week's give, a copy of The Amazing Bone is Paula! Drop me a line with your info to webe(at)soon(dot)com, and I'll get the book out this week. As for the rest of you kids, here's hoping. Loved Blueberries for Sal when I was a kid! I love McCloskey and this one is one of my favorites. We would love to have this in our home library. I have always loved this book . . . yet never managed to own a copy! Now quite sure why . . . I'd love to add this one to my little one's library. Thanks for the chance. OH, this is a childhood favorite of mine. Put my name into the hat please! thank you. I love this book! We used to go blueberry picking when I was a kid and I was sometimes a bit sad that there weren't any bears in the area. Teaching kids complex concepts forces one to re-evaluate our own understanding of it, doesn't it? We haven't talked of human rights before, it is time now for me too to initiate this discussion. Wonderful video. SO very important - thanks for posting it here. Would love to be entered in your giveaway. I grew up having my grandmother read this book to me over and over. I can still hear her making the plunking sound effects. Sadly! we do not have this book in our home yet so I would love a copy. Thanks for these giveaways, they are so much fun:-). One of my favorite books when I was a kid. Thanks for the opportunity! My kids love this book so much that we gave a copy to a favorite aunt for Christmas...yet we don't have one ourselves! Thanks for posting the Dream speech video. I hadn't watched it in a couple years. It always inspires me and brings tears to my eyes. Blueberries for Sal is one of our favorite books! We've borrowed it from the library several times, but don't own a copy yet. Sal reminds me so very much of my daughter! She looks almost exactly like her and is just as full of adventure. I'd love to be entered in the Great Monday Give. have not read this one yet, but it is on my list! I've never read this book before. Sounds like a great book to win. I loved reading Blueberries for Sal when I was little. I keep meaning to pick up a copy to share with my son! Thanks for the chance to enter! My wife grew up near the Blueberry capital of Canada. I'm sure she and our soon to be born child would enjoy the book. oh i would love a copy of that book. I remember it from childhood, but never had a copy. Always saw it in the library. We live in WAshington DC and havent had a functioning library in our neighborhood since we moved here 5 years ago... I cant wait for the new one to open, so I can bring my daughter and check out lots of oldies but goldies. This is one of my favourite McCloskey books! Thanks for the chance! I love this book! It's on our book hunt list. Thanks! Sad to say that I've never read this book, but would love to add it to my daughters' collection! I'd love to have this book for my little one. I also loved this as a kid. I love the illustration of Sal and her mother canning blueberries in the kitchen. Thanks! I'd love to add this to our book selection. Seeing this book brought back some childhood memories! I'd love to share it with my own daughter! I would love to get a copy of this book. I keep hearing great things about it. This is one of my favorite childhood books. I used to get it from the library all the time! Sadly, though, I still don't own it after all these years. I would LOVE to win it and share it with my children and later my grandchildren. It would be much loved! Thank you for the chance to win it! I would love to give this book to my grandson! kerplink, kerplank, kerplunk. I'd love to read again about blueberries hitting the bottom of Sal's pail. I'd love this for my son!